After the very successful Oxford Workshop every other year from 2008 to 2016, coached by members of the UK Albion Ensemble and others, we have booked a repeat event for the fall of 2018. 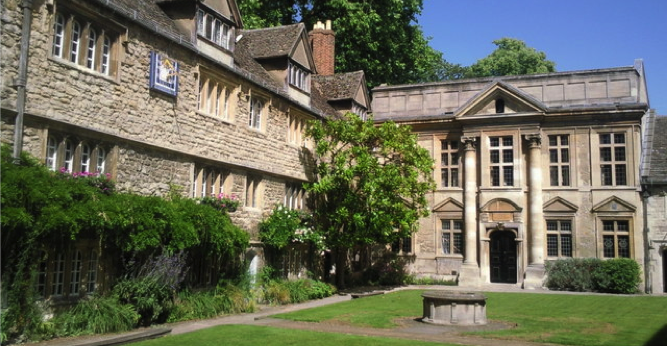 St. Edmund Hall – This college traces its history back to the academic halls of the thirteenth century, and is one of the oldest institutions in Oxford University. It has a small, intimate Front Quadrangle, surrounded by buildings that date from the seventeenth century. We shall use rooms and halls dating from this period as well as the newest buildings in the college. There will be free time during the workshop for sightseeing in this historic city. There is also an excellent music shop (Blackwells Music) for sheet music, books and CDs. Registration will take place at St Edmund Hall, Oxford University, on Sunday August 26 from 9:00 a.m to 10:00 a.m. and on Sunday evening from 6:00 p.m. to 7:00 p.m.
On Sunday August 26, there will be an optional tour (TBA), leaving at 10:00 a.m. An option will be provided in the registration form to select this excursion at an extra cost. After dinner on the Sunday evening, there will be a cash bar social to get to know each other. Monday August 27 through Friday August 31st will be spent playing in coached ensembles. Departure is after breakfast on Saturday September 1. Please see the separate page for advice on travelling internationally with musical instruments to the workshop. Coaches are drawn from members of leading UK and European chamber music ensembles and orchestras, including the Albion Ensemble, the Schubert Ensemble, the Razumovsky Ensemble, the Coull Quartet, the English Chamber Orchestra, the London Mozart Players and the BBC Symphony Orchestra: Confirmed so far are Robert Manasse, Flute; George Caird, Oboe; Marie Ross, Clarinet; Roger Coull, Violin; and Jane Salmon, Cello. Details of the coaches are here. The instrumentation will be woodwinds: Flutes, Oboes, Clarinets, Bassoons and Horns; strings: Violins, Violas, Cellos and Basses. We also anticipate resident piano accompanists. This workshop is for advanced or intermediate amateur players. We ask all applicants who have not attended a previous Kammermusik Workshop to complete the ACMP self-grading questionnaire so that we can select participants and assign appropriate music. If you’ve been before but have improved since then, feel free to take the test again! If you haven’t been before, you may, if you wish, send us a recording and/or a reference from a teacher (see the questionnaire for details). This is not essential, but does help us in assigning groups. What will happen each day? In the Oxford workshop, we shall play a mixture of large and small group music. Each day, one or two large groups will play works such as the Spohr Nonet, Mozart Gran Partitta or a chamber orchestra work such as a Brahms Serenade, the remainder of the participants will play in groups of 2 – 6, with or without a piano. An extensive library will be available of such works. Groups will change each day, though larger works may span two days. We shall endeavour to match players with parts of appropriate difficulty. Feel free to explain your background to us in a comment or email, in addition to completing the ACMP rating (honestly!). A short and very informal recital of some of the works rehearsed in the day will be given before dinner each evening (but after players and audience are refreshed from the bar!). These are “works-in-progress” to introduce others to the very wide repertoire that we use in the course and to give experience of performing with relatively short preparation time. Most people are pleasantly surprised by what can be accomplished in a day, and this is an important distinction between Kammermusik Workshops and many other courses, in which the emphasis is on polished performance of a narrow repertoire at the end of the course. Participants should therefore expect to perform several times during the week but can be assured that the atmosphere is supportive and not critical! There will be some time in the afternoons and evenings for informal pick-up groups. Players are encouraged to bring any music that they specially want to play. No individual lessons are included in the workshop schedule. However, participants are welcome to arrange individual lessons privately with a coach. The standard fee for these lessons is £60 an hour, and payment should be made direct to the coach. Here is the table of options and costs. You are welcome to bring a guest to the workshop. Guests will pay no workshop fee and pay the same prices for meals and accommodation. Arrangements may be made (in advance only, by contacting the workshop director) if your guest only wants occasional meals rather than the full week package. Most of the rooms will be in the modern Miller Building, a short (6-8 min) walk from the college. A few rooms have been reserved in college for those with walking difficulty. Rooms may be reserved for extra days after the workshop, but the earliest day for check-in is Saturday 25 August. College accommodation must be booked through Kammermusik, but non-resident players are welcome and you may also make independent arrangements for accommodation. Please note that charges and payments for the UK workshop are in pounds sterling. The current exchange rate is roughly £1 = $1.40. PayPal may be used to send money conveniently from the US to the UK. We have had so much trouble at both ends with international bank transfers that we are only accepting Paypal; however, UK account holders may pay by UK cheque or cash as well as by PayPal. We have a limited financial aid program which allows us to award a few “scholarships” up to around £400. To apply, please make the appropriate selection on the registration form. More on scholarships can be found here. Complete the online registration form by June 1, 2018. But don’t delay – available spots fill up quickly! Registration will be confirmed once you are accepted for the workshop via email and have paid a deposit of £100 (you will receive email instructions on how to do this). The balance may be sent in advance or paid at the workshop. You may cancel your reservation up to July 31, 2018 and will obtain a full refund of any payments. Cancellations on or after August 1, 2018 will forfeit the deposit. Kammermusik Workshops is excited to announce a reciprocal discount of 20% for our attendees who, within 18 months, attend the Ischia Chamber Music Festival. Or for Ischia players who join a Kammermusik Workshop. Those who have attended last year’s or this year’s Ischia workshop will find an opportunity on our registration form to claim the discount. Please visit https://ischiachambermusic.org/faqs/ to learn more about the Ischia festival. After you are accepted into the workshop, additional workshop details will be provided via email nearer the time of the workshop. You also may contact the Workshop Director by email if you have any other questions. This is your formal notice under privacy and data protection regulations that information that you submit to Kammermusik Workshps will be kept on a computer database on behalf of Kammermusik Workshops, Inc. and will not be shared with any other groups or forwarded to third parties without your express permission. This program has been made possible in part through the generosity of ACMP – The Chamber Music Network, and the Clinton B. Ford Fund of its ACMP Foundation, an organization that promotes chamber music activities for amateur musicians. To find out how you can assist with workshop sponsorship, click here.